Our lab is developing new ultrafast vibrational techniques to study the nuclear geometry changes during ultrafast photochemical and photobiological reactions and the vibrational coupling that allows energy flow in small molecules. 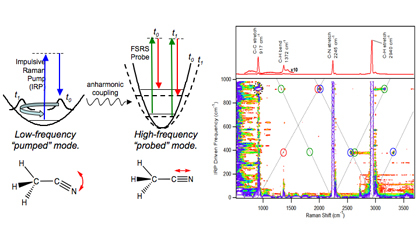 Our primary tool for these studies is a laser spectroscopy technique called femtosecond stimulated Raman spectroscopy, or FSRS, that allows the collection of high-resolution vibrational spectra with time-resolution better than 100 fs (see Figures 1 and 2 below). The power of FSRS is that it allows collection of a complete vibrational spectrum of a reacting molecule with unprecedented time resolution. This enables the determination of molecular structure as a molecule moves through transition states on the excited-state or ground-state potential energy surface. In one set of projects, FSRS is being used to determine structural changes during charge-transfer events and during the extremely short-lived electronic excited states of DNA (Figure 3). Additionally, our lab will be studying vibrational coupling by impulsively driving molecular vibrations and then observing the movement of the vibrational excitation through the molecule (Figure 4). Figure 1. The laser pulses, energy diagrams and detected spectrum relevant to femtosecond stimulated Raman spectroscopy. The actinic pump is an ultrafast laser pulse in the ultraviolet or visible spectrum that initiates the photochemistry of interest. 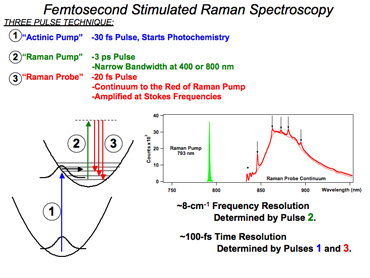 At a variable time-delay later, the Raman pump and probe obtain the Raman spectrum of the sample, which is apparent as amplification in the broad probe spectrum at Raman resonances off of the Raman pump frequency. Figure 2. Schematic of the optical setup for FSRS. We start with a commercial femtosecond titanium:sapphire laser system (MaiTai, Empower, and Spitfire) and then assemble the necessary linear an nonlinear optics to produce the three necessary laser pulses. Figure 3. Electronic states involved in the photophysical relaxation of nucleic acids. Shown are the ground-state thymidine dinucleotide, T2, and the two primary photoproducts: the T<>T thymidine cyclobutane dimer, and the T[6-4]T cross-linked dimer. Conical intersections are indicated by “CI”. Adapted from Crespo-Hernandez et al., Chem. Rev. 2004, 104, 1977-2019. Our lab is investigating the structural dynamics that occur after DNA absorbs ultraviolet light. There has been a great deal of effort by scientists around the world to determine the photophysics of this very important molecular system. 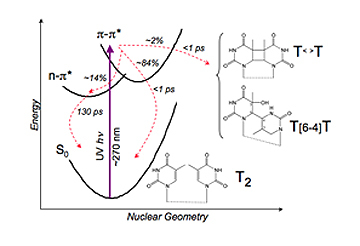 Most of this work has used ultrafast electronic spectroscopy, such as transient absorption and time resolved fluorescence, to determine the kinetics of relaxation following UV photon absorption (see for instance, Crespo-Hernandez et al., Chem. Rev. 2004, 104, 1977-2019, Hare, et al., Proc. Natl. Acad. Sci. 2007, 104, 435-440 and Peon et al. Chem. Phys. Lett. 2001, 348, 255-262.) Because of these efforts, scientists now know a great deal about the kinetics of DNA photophysics; however, we still lack information on the structural dynamics, that is how the molecular geometry is distorted, during the relaxation process. Time-resolved FSRS spectra will be able to determine how the ultrafast internal conversion process is driven by changes in the excited state structure. Figure 4. Schematic of 2D-FSRS experiment and the resultant 1D and 2D Raman spectra of acetonitrile. We are developing a new multidimensional spectroscopy, entitled 2D-FSRS, in order to determine the vibrational couplings that drive energy flow through molecules. This experiment shows promise to unravel the couplings between Raman-active vibrations in much the same way that 2D-NMR techniques are used to probe magnetic couplings between nuclear spins. 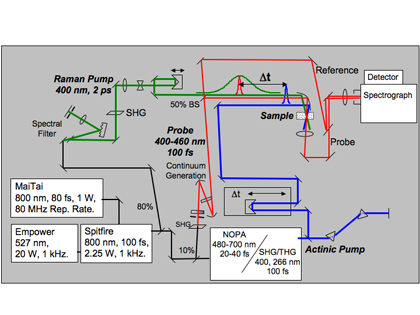 As shown in the experimental schematic in Figure 4, we will drive low-frequency vibrations into coherence and then probe the high-frequency Raman spectrum with a Raman pump-probe pulse pair (similar to work by Kukura et al., Phys. Rev. Lett. 2006, 96, 238303.) Anharmonic coupling between these two sets of vibrational modes will appear as peaks in a two-dimensional Raman spectrum, like the acetonitrile spectrum shown in the figure. McCamant, D. W. Femtosecond Stimulated Raman Spectroscopy. Encyclopedia of Spectroscopy and Spectrometry, 3rd Edition, ed. George Tranter, Elsevier (2017).